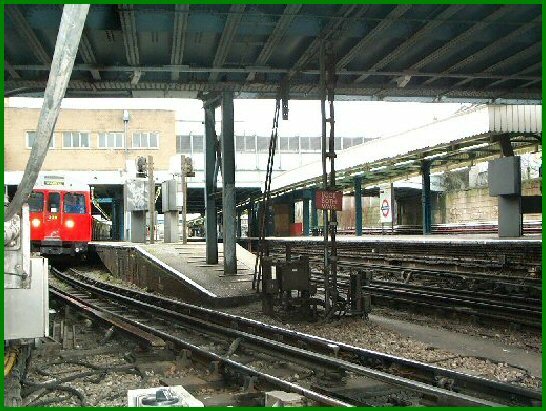 Whitechapel is another location which has four platforms, a siding (actually two, but one is now decommissioned) a signal cabin and a multitude of possible 'moves' that can be made by trains. 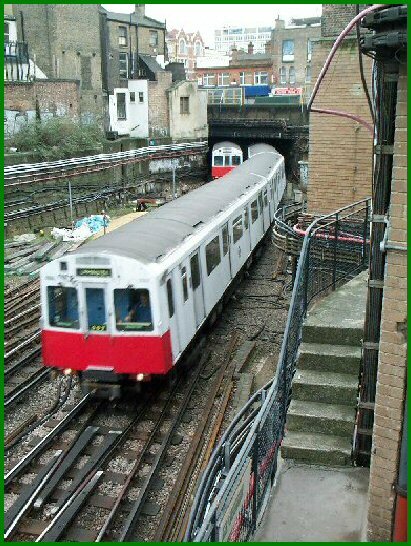 Reversing can be done from all four platforms; the eastbound platforms are routinely used by Hammersmith and City Line services timetabled to reverse there but, although there are no timetabled District Line 'reversers' it is a frequently used option, particularly at times of disruption. The following photos supplied by Tube Troll are taken from the area of the Signal Cabin (views of which can be seen here). 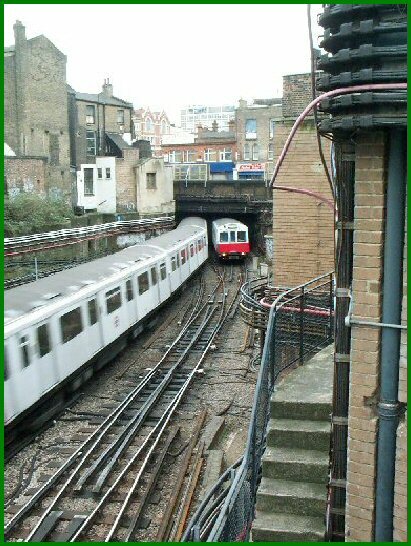 As mentioned above, Hammersmith and City Line trains routinely reverse back towards Hammersmith at Whitechapel. Here we are looking east and can see a C Stock train in platform 1, what is normally an eastbound platform, waiting to head westbound - as you can see the headlights are lit and the driver is in his cab waiting for the starting signal to clear. As you will also note there are monitors at this end of the platform - a requirement if a train is to depart in passenger service. Just out of shot to the right of the picture is the walkway from the signal cabin to the platforms, however the red sign beneath the bridge warns pedestrians to 'Look Both Ways' - trains can be coming from either direction. The next two pictures are both looking westbound in the direction towards Aldgate East. In this picture the train to the left is departing westbound from platform 3. Just ahead of the train approaching on the right is the pointwork that will take a train departing westbound from platforms 1 and 2 across to the westbound road. To the bottom left of the picture, adjacent to the departing train, is the pointwork that divides platforms 1 and 2. As set the points will take the approaching D Stock train into platform 2. This picture, taken a few moments after that above, has the approaching D Stock on the pointwork to platform 2. The driver will almost certainly have his speed well down - on three of the four platforms there are draw up signals, all of which have notoriously slow trainstops attached to them - many an unwary driver has been caught on these! Whilst the signal has cleared the trainstop goes down very slowly, which will (as intended) cause the train to come to an ignominious stop! The following photos are mine, and look in more detail at the platforms themselves. This is the view looking west (towards Aldgate East) from platforms 3 and 4. Tha station starters for these are visible between the mirror and monitor equipment. The signal cabin is to the right, though obscured by the monitor. EN35 is the station starter for platform 1. The shunt signal EN30 allows access to the siding to the east of the station. The view from the east end of platform 2; the station starter for this platform can be seen at the end of the bridge; under this bridge are the East London Line platforms. This view is taken from platform 4 - normally a west bound platform, although looking east. The signal visible (EN38) is the 'Wrong Road Starter' which would allow trains to head back towards Stepney Green. The track to the right is the other siding at Whitechapel. Taken from the east end of platform 3, again normally a westbound platform, the 'Wrong Road Starter' EN37 is just visible, being fixed to the wall of the footbridge structure. It fulfils an identical function as the signal in the previous picture. There are monitors/mirrors installed at both the last two locations, though not visible in these photos.